Set of 3 Mensa Pocket Puzzles Metal with FREE Bonus Puzzle QuestionsThree classic metal puzzles given a Mensa rating of hard, harder and hardest. A must for anyone who enjoys testing their logical thought process to the limit. 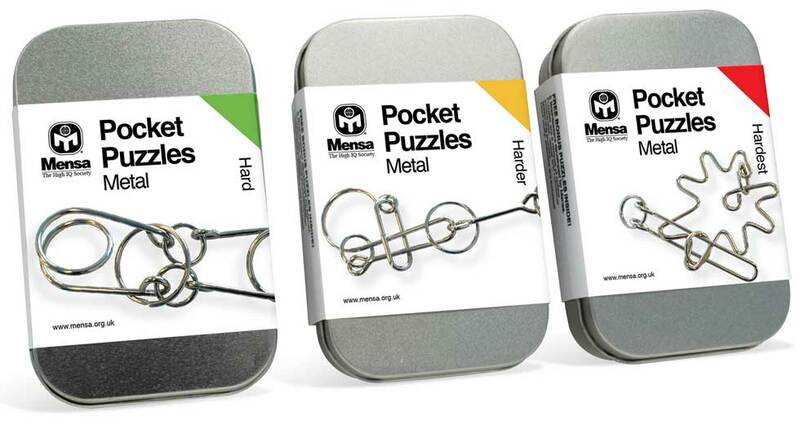 Pocket sized and challenging.FREE Bonus Puzzle Questions5 Brainteasers developed by the Mensa puzzle team are a mixture spatial awareness, verbal and numerical reasonig puzzles. Don’t worry, answers are included! Light up flashing finger flingers skill and challenge toy.